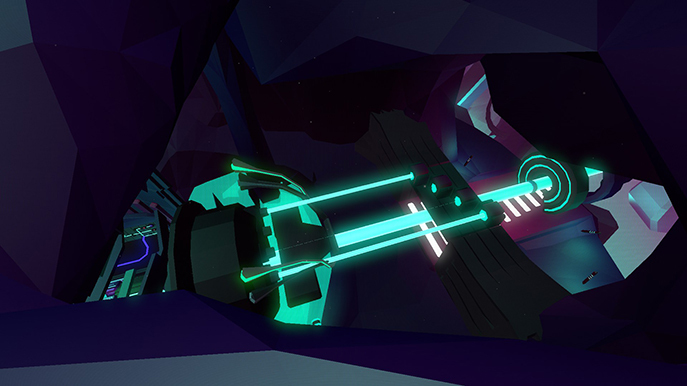 The first thing you'll notice about FRACT OSC is the wonderful aesthetic. The world is sublime; near bewildering landscapes of abstract shapes sprawl out in all directions from your starting point, areas colour coded to fit a theme and landmarks unravelling themselves in front of you in time with the music they emanate. Beyond the looks this is a tough world, one with fiendish puzzles and no handholding whatsoever. 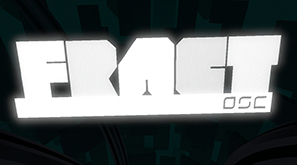 At it's heart FRACT OSC is a open world music based puzzle game. 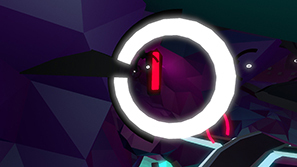 My initial thoughts were something along the lines of the puzzles of Antichamber (but these are within the laws of physics) with the aesthetic of Master Reboot and the music of 140. After a short sequence (which turns out to be a tutorial, something you don't realise until you start encountering the puzzles) you are dropped in to the main world. The are three colour coded pathways; pink, green and cyan. Each of these areas has one unique puzzle type and one variation on a secondary puzzle. Going into the game without knowing anything about it (which is what I did) is ideal. It is intimidating at first. You may stumble across the first puzzle in each area and even solve them, but then wonder around aimlessly for a while not finding anything new. It's easy to get lost in the stunning visual presentation, but equally easy to get lost literally, becoming disorientated with the abstract paths that are at first difficult to distinguish from one another. Two of my first four hours were spent wondering around, becoming increasingly frustrated at the lack of progression. I felt the challenge should be in the puzzles themselves, rather than in finding the puzzles. But during this time I began to notice things in the landscape and started putting together how the world works and how it was built and had no problems progressing from there. 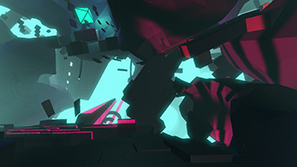 The puzzles in FRACT OSC are a joy. The are complex and a real challenge to solve but clear in what you need to do in order to complete them. By pressing LB or right clicking you go into interaction mode, with symbols that were previously invisible appearing where you can interact with the puzzles and various platforms. 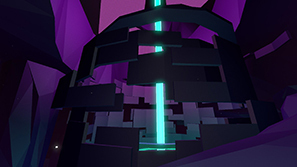 The puzzles involve rotating and raising platforms, moving blocks and rotating plates in order to connect the colour coded beams that power the world. While this may sound like tedious way to solve puzzles, I assure you it's not. They are very well designed, visually appealing and the feeling of solving them with the animation, music and colour bursting into life is euphoric, sometimes causing me to pump my fists in the air. Very satisfying indeed. Solving each of these puzzles opens a secondary puzzle in which you have to place notes down in a specific pattern to overcome an obstacle. This leads me to the music. Loud and engrossing techno/synth activates when you solve puzzles and emanates from artefacts across the land. I found the music to be highly enjoyable and very fitting with the rest of the game. And what is your reward for solving these puzzles? 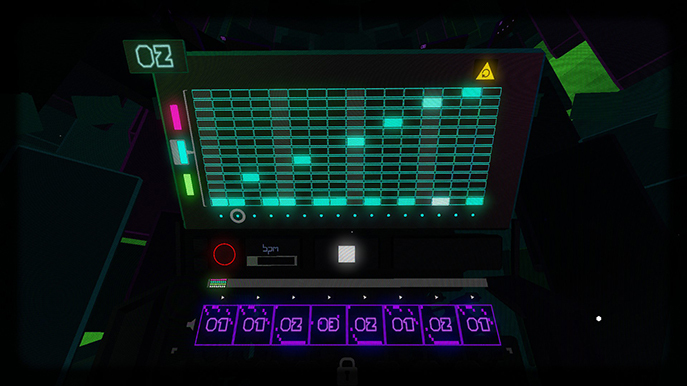 You unlock sounds and modifiers to play with and compose your own pieces, with the ability to record and save your work. This is presented in the same stylish manor as the rest of the game but the interface remains clear, easy to use and fun. I've yet to compose something I'm happy with but this will keep me coming back to the game. I've had a great time with FRACT OSC. Playing with the lights off and headphones on immerses you in the atmosphere and after the frustrating early couple hours I spent wondering aimlessly the game really came into life. The puzzles are challenging but solvable if you think logically, the rewards for completing them are great and the world is a joy to explore. 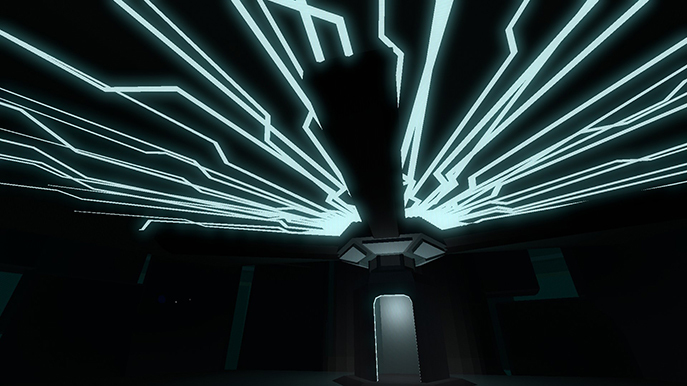 The fast travel system is brilliant too; flying you through glowing rings across the entire world to your destination. At first you may think this world is abstract and obscure but nearly everything is constructed and placed with precision. There are hints everywhere about the way the world works and once it clicks with you the only thing holding you back will be the puzzles themselves (which get very tricky later on). FRACT OSC may not be for everyone. I can see people giving up after getting lost in exploration or if they can't solve some puzzles, but anyone who likes puzzle, exploration, music or aesthetically immersive games should absolutely play this.